A domain name is basically the address of your website. Not many people realise that domain name is an integral part of their company brand or business identity. Domain names are pretty much like any trade names out there, logos or brand names. Therefore a domain name has to be easily remembered and recognised by your customers and businesses. It is also a good practice to keep your domain name short, normally we would recommend one to two words, or three words at most. There are 2 kinds of domain names you can register. 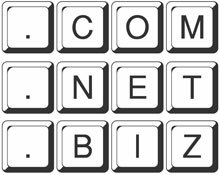 If you are doing business within Australia only, then we highly recommend Australian domain names (www.yourcompany.com.au) or if you’re running an International business and have customers all over the world, then we recommend you to go with Top Level Domains (www.yourcompany.com). It can be quite challenging when it comes to choosing domain name for your website, as most common good domain names have been registered, especially domain name with common words (or we say ‘keywords’) such as business.com.au, telephone.com.au, and name of places such as brisbane.com.au and so forth. A domain name does not have to be catchy, in fact, remember it has to be easily remembered and pronounced! Once your website is up and running, the chance is that you will be mentioning your domain names quite often to customers or businesses you meet. So keep it simple! A one or two words domain name is the best way to go in most cases. As for which extension to use for your domain name, it really depends on what sort of company or organisation you run. If you run an Australian commercial organisation or company then the Australian domain name .com.au (read: dot com dot au) is your best choice. If you are running a non-profit organisation, then the .org.au is the way to go. Below is some explanation on the Australian domain name extensions that are available for registration for companies or organisation based in Australia. .org.au .org.au is for verifiable non-profit and charitable organisations. Please contact us if you wish to register a new domain name or if you have any question about our domain name service.